T.J. Oshie scored the go-ahead goal with 4:58 to play as the Blues dominated in the third period holding the Calgary Flames to just four shots in the third period of St. Louis Blues snap a four game losing streak with a 4-3 win on the night they honored former star Brett Hull. 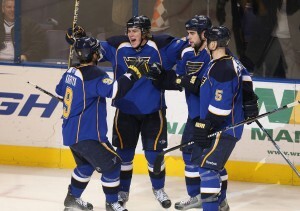 The Blues are now 6-10-2 at home. Brad Boyes had a big night for the Blues as he assisted on their first three goals. Oshie’s goal was his second game winner of the month. Andy McDonald and Alex Steen scored for the Blues. They had struggled going 14 and 12 games respectively without scoring a goal. David Backes added the other Blues’ goal. Oshie goal came from the slot as the Blues were pushing the puck up the ice. Oshie took a pass from Paul Kariya and beat Flames backup goalie Curtis McElhinney. The Blues are back at it tonight at Chicago.